Pennsylvania Dutch cooking has several hallmarks, one of them being the combination of sweet and sour. Vinegar and sugar, or, like in this recipe, brown sugar, mustard and Worcestershire sauce. Combining the sweet and tang is just a flavor profile all it’s own. Counting calories is not one of the local traditions! This recipe is making the rounds in the Lancaster County Mennonite circles. I have no idea where it started. 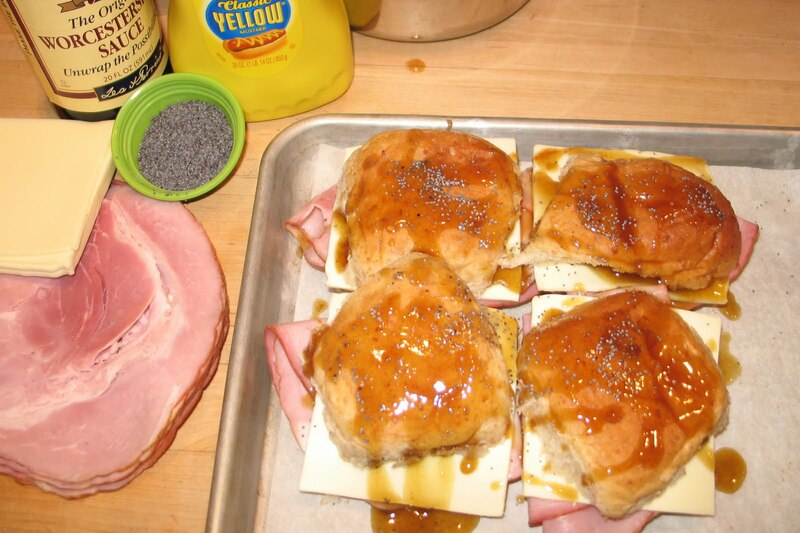 Place tops on the sandwiches, drizzle with the remainder of the sauce and sprinkle with the poppy seeds. Bake for 15 min or just until lightly browned. I used Costco rolls that came in a big bag and were somewhat firmer than the really soft potato rolls. We like the heartier bread but I must say that I love the softness of the potato rolls. It is like Mac and Cheese, comfort food. Either way, these are wonderful and make a great sandwich for a shower or party. My mother often makes these around the holidays and they're SO GOOD… only, it has be swiss cheese (no american! ), and sometimes we make them with very thinly-sliced country ham, not regular ham. We always called them Mary's Buns. But, yeah they are ridiculously good. Thanks for posting!